Coping with these symptoms is a difficult challenge and to be able to function properly on a day to day basis and maintain a quality life may seem impossible. 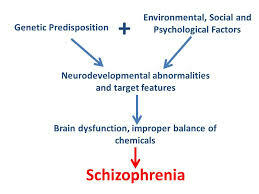 But there are strategies on helping a person cope with having schizophrenia and lessen the severity of these symptoms. Hallucinations: These are false perceptions without any external stimulus. For e.g. hearing of voices in your ear when no one is around are auditory hallucinations. Likewise there are Visual Hallucinations, olfactory, gustatory, tactile, all related to the 5 senses like hearing, seeing, smell, taste and touch. The most common hallucinations among schizophrenic patients are auditory hallucinations. 1) Distractions: Distracting oneself when hallucinations are ongoing with listening to music or watching TV helps aid in controlling the hallucinations. 2) Fighting back: Studies suggest that instead of resisting the voices which tend to lead to depression in many schizophrenic patients, fighting back with yelling “Stop!” or talking back to the voices helps a lot. 3) Mindfulness technique: Staying aware of the present environment and using the technique of “Acceptance and commitment” in which a person acknowledges the voices but does not agree to accept the guidance they give. 4) Be Selective: Voices heard in hallucinations may be either positive or negative. Willing to listen to the positive voices and asking the negative voices to stop or being firm and saying one will only pay attention if the voices have something useful to say can be used as a coping method. Delusions: They are beliefs held with strong conviction despite evidence to the contrary. Persecutory, grandiose, referential, infidelity, control, guilt, is to name a few. 1)Distraction: Distracting oneself with music or watching television or engaging onself in a task such as a puzzle or artwork. 2) Asking for Help: Surrounding yourself with friends or family or a health care provider for support to provide a source of distraction or just a listening ear. 3) Yoga: Engaging oneself in a few minutes of meditation each day and regular yoga helps in balancing the body, mind and spirit. Exercise or going for long walks or jogs has proven beneficial in coping with delusions in schizophrenia. 4) Early intervention therapy : People diagnosed with schizophrenia and suffering from delusions and hallucinations may attend group or individual sessions on a weekly basis in which coping skills are emphasized and recognizing early signs and triggers and reporting a change in symptoms helps the healthcare provider schedule regular visits and mediation adjustment as per need. Using these few simple strategies along with the prescribed medications for schizophrenia aid in lessening the severity of the symptoms experienced by a person and maintains a balance and provides a better quality of life.